a Holiday Card to a Birthday card! and the Teachers are AWESOME! you a Happy Birthday... and I thought WHAT??? Who Does That? staff at my school... and I've really enjoyed doing it! Well.. that's about it for this week! Very pretty card! I'm really liking that chalkboard look of your tag! Such a great gesture to do this for the school staff! Have a fab weekend! That is gorgeous. Very sweet of you to donate your cards. I know I would much rather get a card than an email! Have a great weekend. I love the beautiful card! !Such a sweet thing for you to do! This is beautiful!' Love the black tag with the sentiment- very striking. How wonderful that you offered to make birthday cards for the staff. I'm sure they appreciate it more than you kniw! Theresa this is so pretty for sure!!! I love how striking a black card base is because it really makes all the other papers/colors pop! Truly beautiful card! How exciting that you get to work at your son's school. I know the staff feel very lucky to receive your cards. This one is no exception. Beautiful. Gorgeous!! And wow, what a great thing to do!!! That alone must keep you busy in your craftroom!! Have a great weekend Theresa!! Yep it is a really pretty card...love the tag! Wow....how wonderful you are to make cards for all the staff, I'm sure they all love them! This card is beautiful, Theresa!! What a sweet thing for you to do!! Have a great day. Wow, you are so generous! I am sure they love your cards! I love this design! The tag is adorable I love the pattern paper..the tag really pops on it! 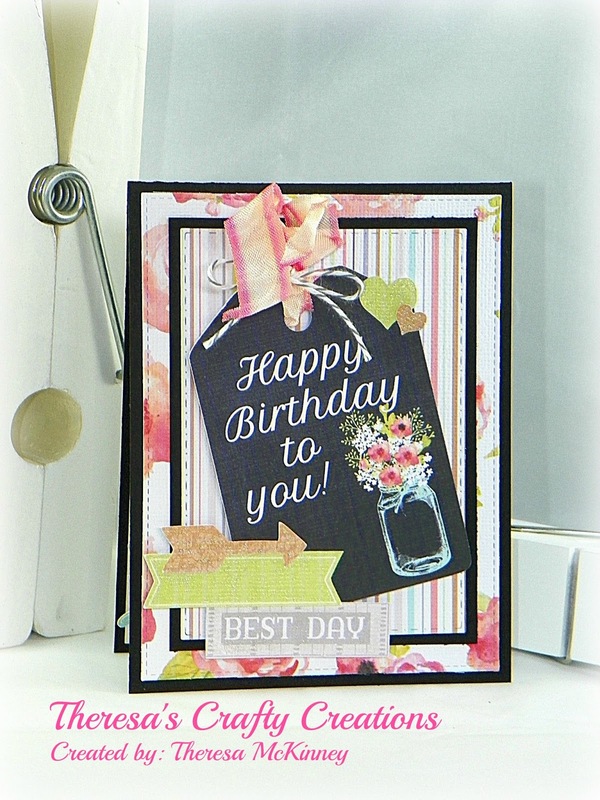 Your card is beautiful and I know the recipients of the cards you create will love them so very much! Wow... this is sooo beautiful! That jar of flowers... sweetness! Teachers are gonna love you for sure! Ohhhhh, I just LOVE that you can use your wonderful creations in such a fabulous way!! What a gift for the teachers! This card is beautiful. The contrast of the pastels and black is so pretty! Love the font on this tag. So cute.